Irukandji will donate at least 5% of its annual profit into research and conservation of the Ocean and its inhabitants every year. Our aim is to participate in field research and assist scientists who are collecting data about wild populations, ocean acidification, the results of over fishing and many more topics. Research is an ongoing important part of our natural world. Irukandji has a not for profit company named SEA SHELTER (Research, Rehabilitate Rescue, Regenerate) working with volunteers, Sea Shelter has grand projects in store including releasing endangered Sharks and Rays to the wild (watch this space). Irukandji also assists the Newcastle University in projects related to the ocean. What we learn here can be applied to the many species that are facing threats in the wild. These programs wouldn’t be possible without the help of thousands of volunteers. You can help us protect our oceans and marine life in many ways. Take3forthesea, The 2 Hands Project and See Red About Rubbish are wonderful initiatives. Every day many people choose to bend down and pick up all the rubbish they can find in their given area. Picking up one piece of plastic can save thousands of Marine Life as that one piece continues to be ingested by new species repeatedly after the original plastic diner succumbed to its blocked stomach. The first piece of plastic that ever entered the ocean is still doing that to this day. Across Australia people are choosing to eat sustainable seafood. Now with the help of an awesome app brought to you by Australia’s Marine Conservation Society more people are able to choose sustainably sourced seafood. 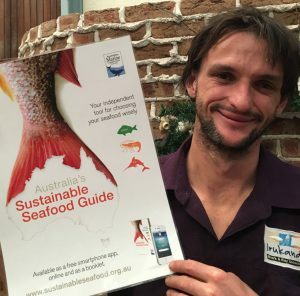 The app Australia’s Sustainable Seafood Guide is a comprehensive guide of the sustainability rating of the fish available in Australia, full of useful information like where and why it is sustainable. It’s a wonderful tool you can take anywhere with you, the perfect guide when considering your menu in the restaurant. Even if you don’t eat seafood, asking “what is the fish?” can help change the world, there is plenty of cheap sustainable fish however often the restaurants don’t even realise its unsustainable until somebody lets them know.